Robert Koch (1843-1910) was a German physician and scientist and the first person to prove that Bacterium are the cause of animal disease. Robert Koch was born on December 11, 1843 at Clausthal in the Upper Harz Mountains in the northwestern region of Germany.Dr. 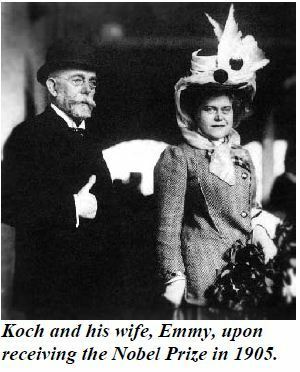 Koch died on the 27th of May 1910 of a heart-attack in Baden-Baden at the age of 66. He has given the famous Koch’s postulates . 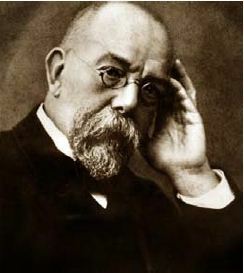 Robert Koch is also known as Father of Clinical Microbiology. He worked on Anthrax and in 1877, discovered typical Bacilli (Bacillus anthracis) with squarish ends in the blood of cattle that had died of anthrax. Other bacteria discovered by Robert Koch are Mycobacterium tuberculosis (1882), Vibrio cholerae (1883), Staphylococcus (1878). He also developed a technique for isolating bacteria on a culture plate.Robert Koch was the first person to grow bacteria on solid culture media. He employed gelatin as a solidifying agent. In 1905 Koch was awarded the Nobel Prize for Physiology or Medicine, which was awarded for investigations and discoveries concerning the disease tuberculosis, “TB”. Koch’s postulate provided guidelines to identify the causative agent of an infectious disease. The pure culture will produce the disease when inoculated into a susceptible animal. It is possible to recover the organism in pure culture from the experimentally infected animal. Why does DNA virus replicate in the nucleus and RNA virus in cytoplasm?